Dogs Welcome at Country House Resort! The Country House and our family’s favorite canine, Riley, are pleased to welcome discriminating dogs and their owners. As dog owners and lovers, we know how difficult it is to find accommodations you can share with your dog. Well-behaved dogs are welcome at our resort. We apologize, but we cannot accommodate other types of pets. We have a limited number of dog friendly rooms & suites. If you wish to make reservations that include your dog, PLEASE CALL THE RESORT do not make your reservation online. 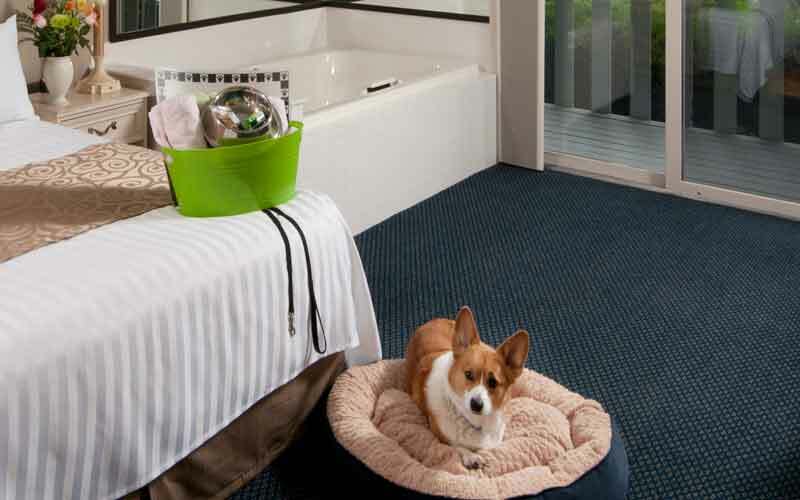 • Dog basket at check-in including dogs towels, furniture cover sheets, information from local dog friendly businesses, waste disposal bags and an all natural welcome treat. Please familiarize yourself with our Resort Dog Policies and Agreement (shown below). You will be required to sign this document at check-in. For the safety and comfort of all our guests, both dogs and people, these policies will be strictly enforced. With your confirmation, we will send a link to the Riley’s Recommendation page. It contains information on dog friendly businesses and activities in Door County. We are pleased to welcome well behaved dogs and their owners as guests at the Country House. To assure the comfort and safety of our dog guests, our staff and other guests, we have established the following policies. Your full cooperation is essential to the success and continuation of our “dog friendly” policy. We wish both you and your dog an enjoyable stay! • All dogs must be registered with the front desk and a non refundable fee of $20.00 per dog, per night is charged upon arrival. Dogs must be pre-registered prior to arrival and the confirmation will reflect the Dog Fee. A $250 cleaning fee will be charged for dogs found in rooms not designated as dog friendly. • Dogs are not allowed in the lobby or in the pool/whirlpool deck areas at any time. • Proof of current rabies vaccination will be required at check-in. • Dogs must be kept on leash at all times. • Dog owners are responsible for walking their dogs in “dog friendly” areas of the resort only. • Dogs are never to be left unattended in guestrooms (while they may be comfortable alone at home, in a new environment, they often get anxious). • At check-in you received a welcome basket for your dog. Please use the sheets & towels provided to cover furniture that may be used by your dog, and for drying off or cleaning up after your dog. • Please use only the designated dog relief areas. 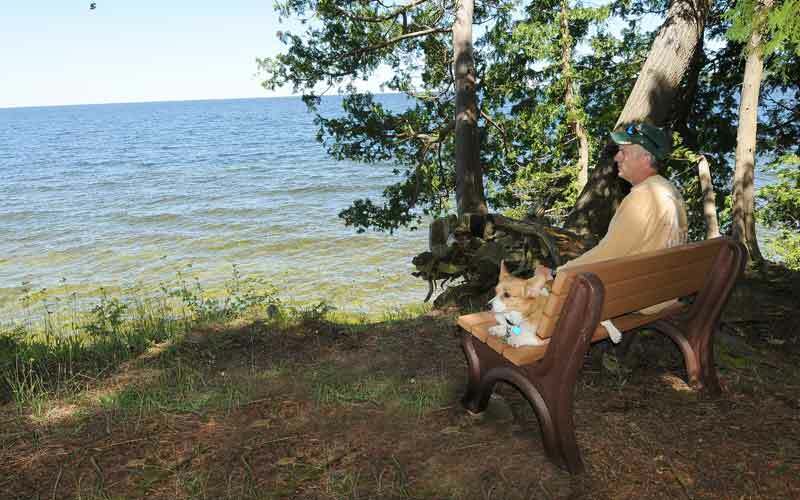 • You must “pick up” after your dog on all areas of the resort property including the shoreline, woods and nature trail. • Dogs are only allowed in the specific dog friendly guestrooms. They are not allowed in non-dog guestrooms at any time. • Noise/disruption complaints - If hotel management receives more than 2 complaints, alternative arrangements must be made for your dog. • Guest will be held responsible for any and all damage caused by, or liability arising from, his/her dog to any person or hotel property. Guestrooms will be inspected at check-out. • Dogs are NOT allowed in any bathtub or whirlpool in guest rooms, as this may cause severe damage in which owner will be responsible for. There is a dog washing station outside by top of nature trail. 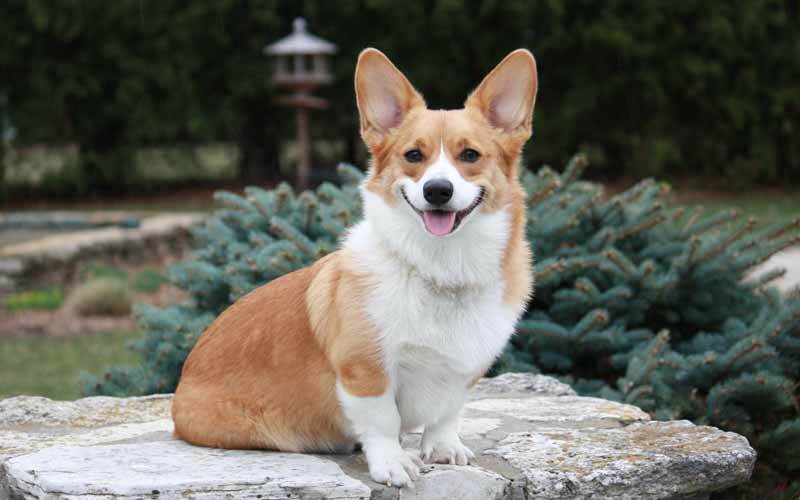 • Dogs must weigh less than 80 lbs. • No more than two dogs are allowed per room. • A cell phone number is required from the pet owner at check in (in case we need to reach you in regard to your pet during your stay). 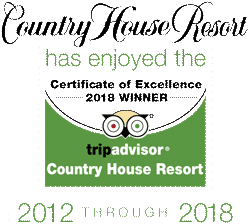 The Country House Resort reserves the right to refuse housing for any dog, at any time, at the sole discretion of ownership and/or management for any reason including, but not limited to, failure to comply with the terms of this policy.